Yesterday's overnight market had balanced within the upper third and initial balance of Wednesday's relatively wide range day. Initial resistance was broken briefly mid-morning with a tag of the prior day's high, but there was no follow through. It was a very range bound balanced day until a late break down to IS bouncing quickly back to IR and the VPOC at the ETH close. The GOOG, AMZN, INTC, MSFT earnings beats after hours have kept the buyers in control overnight. The range so far is 2557.50-69.50 versus settlement at 61.50. Zones remain the same as yesterday, as below. 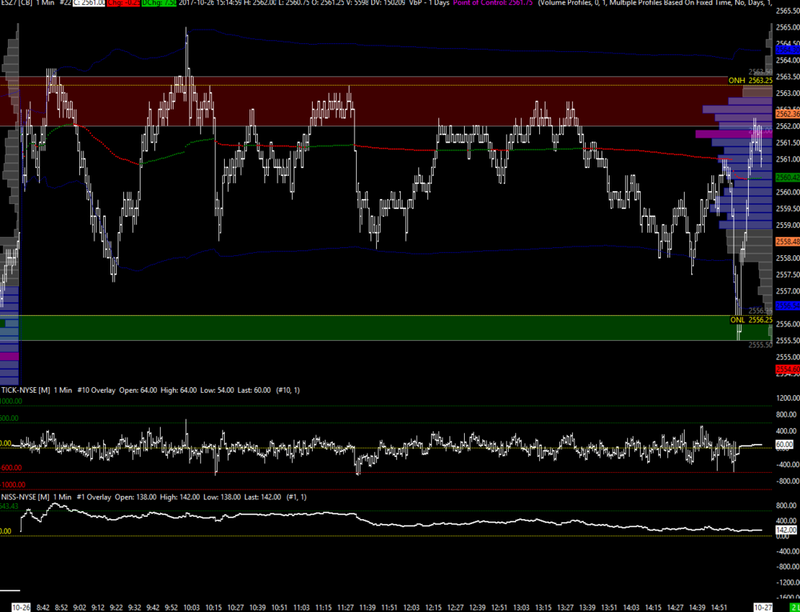 Overnight has already hit the 69.00-70.25 Initial resistance zone. Short term trend is back in line with the larger time frame again, and we'd need to see yesterday's low taken out with acceptance below before this changes.